The Body (Penguin Readers version) by Stephen King, Sci Fi. Book is in good condition, all pages intact. Four boys go looking for a missing friend, and find out how dangerous and cruel the mundane world can be. 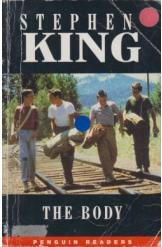 The story that was adapted into the movie "Stand By Me," rewritten in easy English.